There is one place. 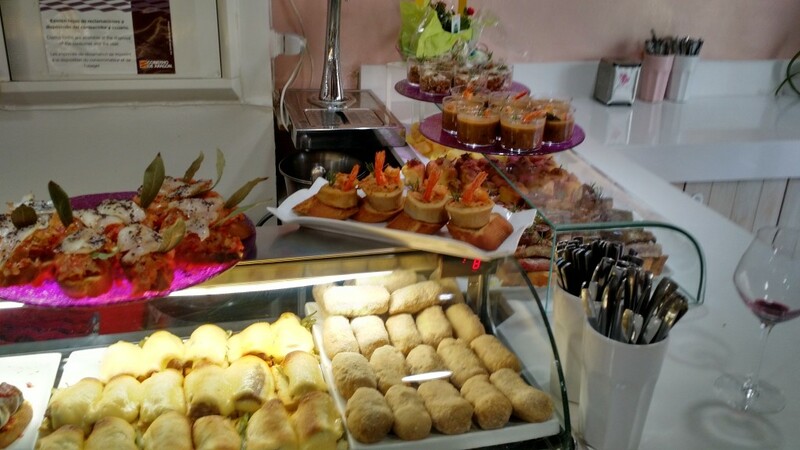 There is one place where you will go if you want coffee, a drink, or food: “el bar”. A typical bar in Spain. 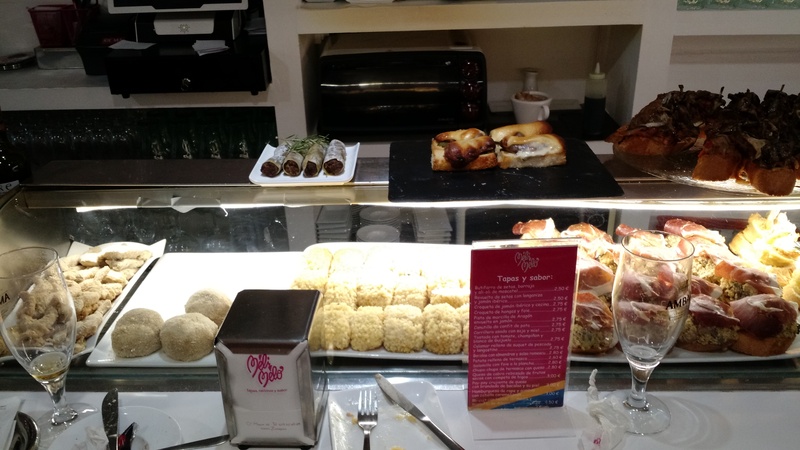 Note the pastries and pinchos (typical ham croquettes and tortilla) up front, then a normal, well-stocked bar behind along with Suzana, one of two bartenders who are typically there in the morning. When I said there are none of the above in the title, that wasn’t entirely accurate, to be fair. What I meant is that there are hardly any as we know them (there are a few proper restaurants, actually, but nowhere near as many as we have per capita because far more people just go to one of the “bars” to eat which far outnumber them). I’ve yet to see an actual cafe. When I say “cafe” there, I mean cafe in the anglo sense of the word, that is a Starbucks, for example, or similar such operation the main offering of which is coffee in various forms typically accompanied by pastries. 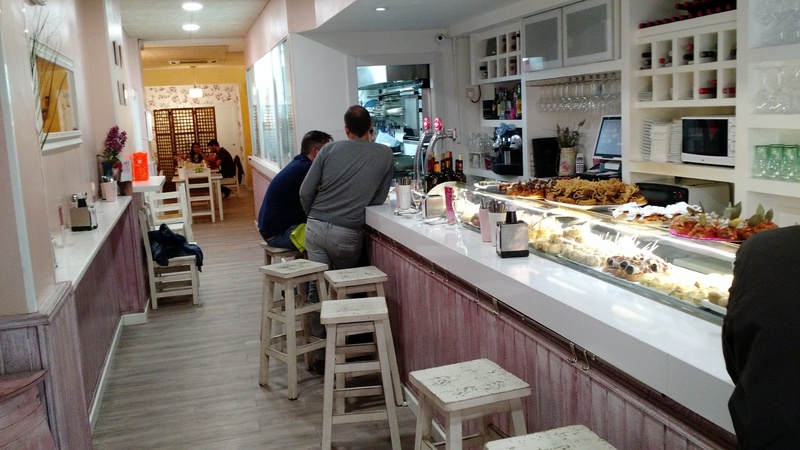 The closest you’ll get in Spain is a pastry shop that just happens to have an espresso machine resulting in a very limited selection of espresso-based drinks to choose from: cafe solo, cafe cortado, cafe corto, cafe con leche, and cafe americano. That’s typically about it. I’ve yet to see anywhere offering cafe mochas (a few have some sort of chocolate-based espresso drink but it’s nowhere near a proper mocha, usually just one of the above espresso drinks with some Nestle hot chocolate mix tossed in), caramel macchiatos, gingerbread lattes (or lattes of any sort for that matter), or anything involving whipped cream which almost nowhere is capable of creating outside of higher-end restaurants that use them on their desserts. I’m not joking: there really are no cafes here. As an American I thought, “that can’t be possible, there must be some misunderstanding” (when being told this by a couple different Spaniards I’d been talking to over Skype before coming here), but there really aren’t, not that I’ve seen. There might be a few in Madrid or Barcelona but if there are I can almost guarantee you there aren’t very many because they’re just simply not popular here, Spaniards go to the bar to get their coffee. I’ve never once seen normal brewed coffee, whether from an automatic drip machine like what most Americans have in their homes or from something like a French press. Most of the grocery and convenience stores here don’t even carry ground coffee – like Folgers or something – that you would use in such machines. I finally saw some at Corte Inglés, a high-end department store here that also has a supermarket covering 2-3 floors, but even then it was a very limited selection that appeared to be entirely comprised of cheaper, pre-ground-and-freeze-dried type of coffees. It’s not popular here at all. God help you if you have a French press and want the good stuff for it (why else would you bother with a French press?) like Kona or Jamaica Blue Mountain – I can only imagine you’d have to order it online and likely from somewhere outside the country at that. Oh, and Spaniards frequently interchange the words “bar” and “cafe”, they’re the same thing to them. From my American perspective I would lean more towards the term “bar” (and amongst Spaniards it’s by far the most popular term for referring to these establishments) since they really appear more to be bars that happen to have an espresso machine than cafes that happen to have some booze laying around. People will start coming in when they open between 7 and 9 AM for their morning coffee and pastry. They frequently bring their kids (babies in strollers, toddlers who run about, the whole lot) and this isn’t the least bit abnormal or looked down upon as it would be at bars in many other countries (remember, what Spain calls a “bar” isn’t exactly what that term means in English, it’s also a cafe and restaurant), or even illegal as it would be in the U.S. where many establishments known as “bars” aren’t allowed to admit anyone under 21 years of age. Cafe Colonial around 12:30 on a Sunday. Note the kids everywhere (3 visible in this picture and a couple more running around). The two in the bottom left were having a little tea party with actual tea (the bar gave them a small pot of brewing tea and two cups with saucers). Between 11 and 3 is lunch time, people will wander in and out, getting beer and wine along with some pinchos, or perhaps even ordering something off the menu (I’ve yet to see anyone really drunk while doing this, they’re very good about their moderation of alcohol consumption). It then really dies down (about the only completely dead time between open and close) from 3 PM until about 8 PM. Many bars will actually close during this time as it’s not worth the expense to stay open. 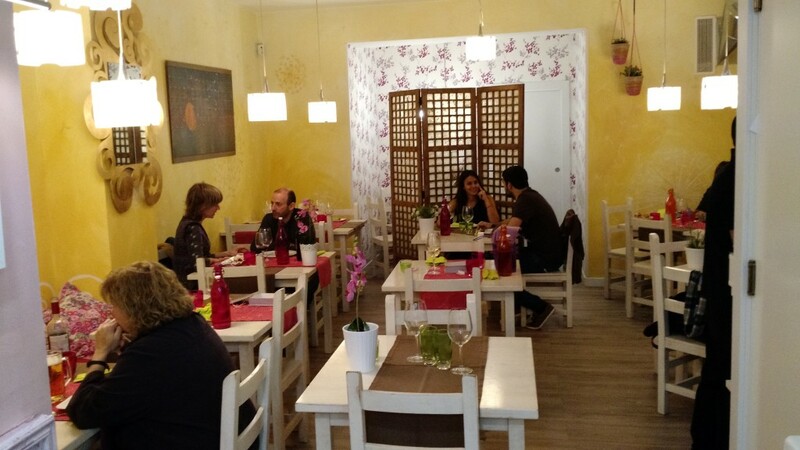 Around 8 PM things start to kick back up again as people go out for their dinner, usually consisting of a couple drinks and some pinchos, or perhaps a dish ordered from the menu. 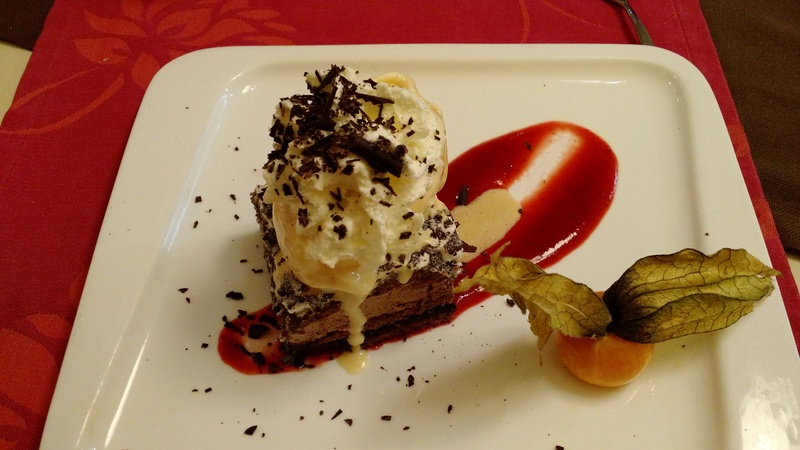 But this isn’t the full-blown 3-course meal of lunch time, it’s usually something smaller amounting to one course (that is: a single entree-amount of food, whether in the form of one dish from the menu or several pinchos) plus a few drinks, that’s it. Most Spaniards, when they go out to eat most of the time, will go to a bar. Typically, the bar will offer two different ways of obtaining food: pinchos or ordering from the menu. 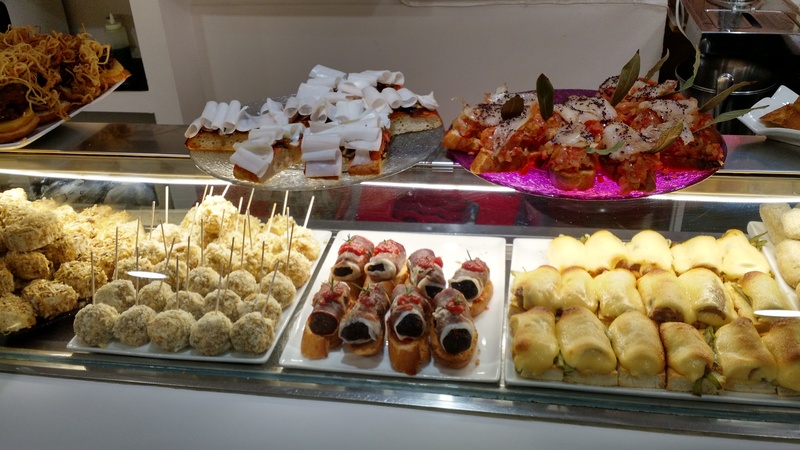 Pinchos are small, appetizer-sized portions of various types of food (usually traditional Spanish ones) that cost around 1-3 euros each, though 3 euros would definitely be on the high end for a pincho, they’re usually in the 1.50-2 euro range. 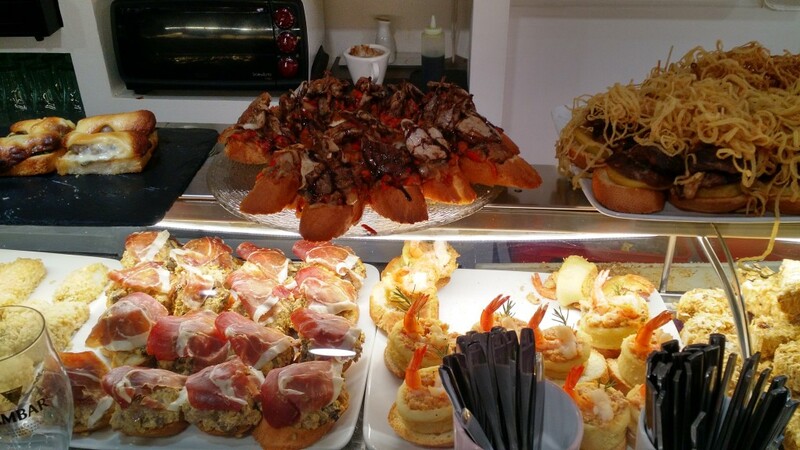 Between three and four pinchos plus a couple drinks would typically amount to a satisfying meal for most people – this will usually come in well under 10 euros for you. 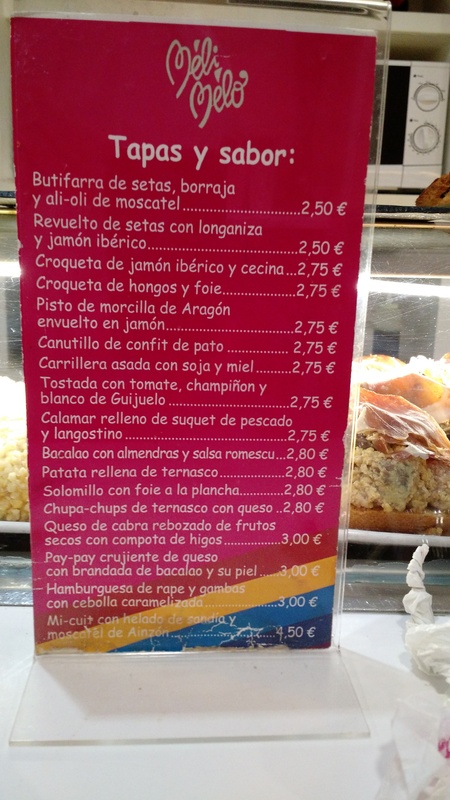 Eating in Spain is cheap (so is drinking, by the way). In fact, most things are shockingly cheap in Spain with the only exception I’ve found so far being ear plugs (5 euros for 3 pairs of the suckers! ), but I’ll address that some other time (the plugs themselves are German which I suspect explains it). Note the food, very limited beer and wine selection, espresso machine to the left of the cash register, and the tables in the back. Then you have the booze, in this case (refer to first pic if you wish) consisting of a fairly limited selection of 2-3 beers (my only real criticism of Méli Mélo, though one that can be leveled at almost every other bar here, to be fair), a decent selection of wine (though, as is almost always the case, all are Spanish), and an also very limited selection of hard liquor (very few people are ordering mixed drinks in a place like this, 95% are ordering beer or wine). Additionally, if you search hard, you can find the espresso machine just to the left of the cash register (look for the computer screen). Ordering from the menu means that you have access to dishes that are not displayed out front as pinchos (though you can order those as well) and which will be made to order, fresh of course, for you just like in a restaurant. I finally got around to sitting down and trying Méli Mélo’s menu items out for a full and proper typical 3-course Spanish lunch. It was fantastic. I mean, it was very, very good food, full stop, without even taking into account price yet. You could, in the United States, charge $30-40US for what I got here and get away with it, easily, not to mention what such a meal would go for in the U.K. (probably £20-50 I’d imagine, more towards 50 in London). It was also fantastic for the price: €13.95. That covers the wine (yes, they refill your glass for free, I had white wine, two glasses of it), bread, first course, second course, and then dessert. Coffee is not usually included, though I have seen it done rarely. Méli Mélo is an above average example of a typical Spanish bar, to be honest with you, but it’s not too far off of what you’ll find if you come here: a few decent (usually local) beers, really good local (Spanish) wine, a good selection of typical Spanish pinchos, and all for very, very reasonable prices. 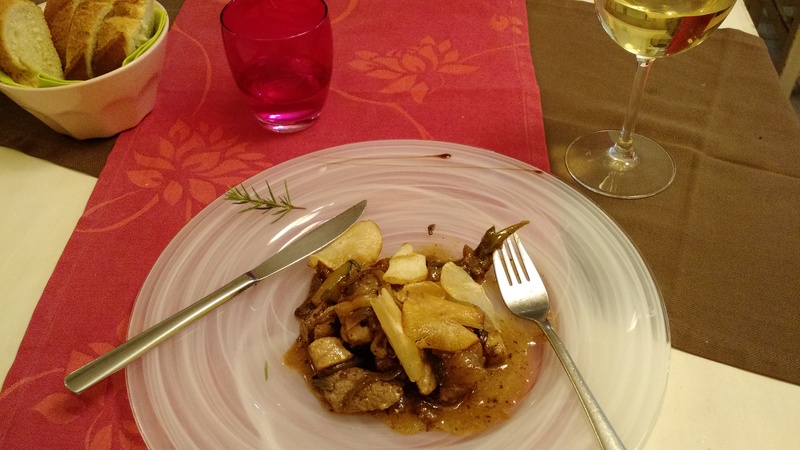 You can easily eat out for every meal and still come in under 30 euros (~$33US at the time of this writing) per day, and that’s including booze). 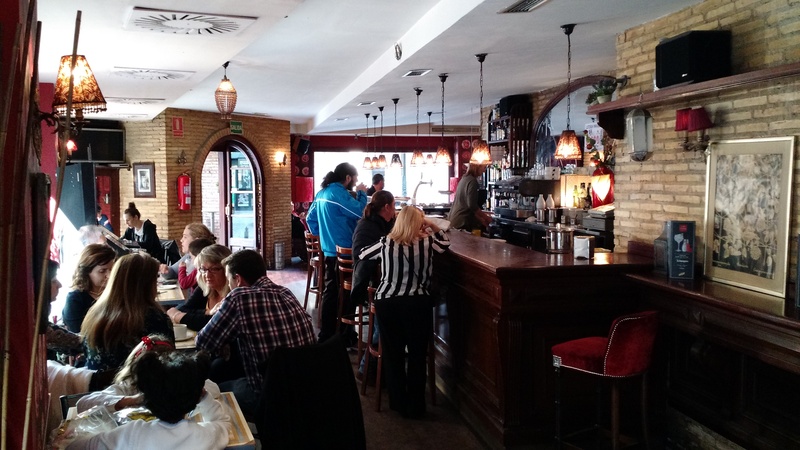 The Spanish go to the bar for almost everything: morning coffee and pastries, lunch, merienda (snack between lunch and dinner), dinner, and then drinks late in the evening. They go to the same place for all of those, and it’s fine. I’ve seen a wedding reception in a bar here just because it was their favorite local bar that they usually went to. The bar is genuinely a fundamental part of Spanish society. 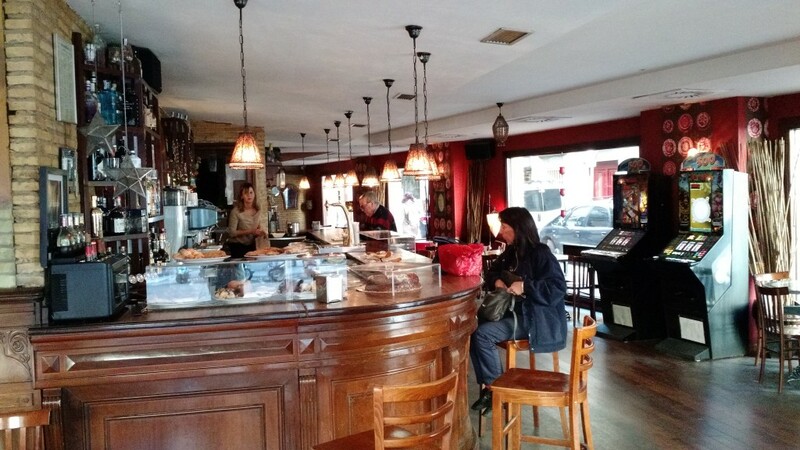 Edit [October 29th, 2015]: My friend, Pablo (native Spaniard), had a look over this article during a language exchange I had with him this morning and I’d like to make a correction based on his input: there are bars as we know them in Spain – alcohol only, no food, usually don’t open until about 8 PM, close very late with a bunch of drunk people stumbling out – but they’re usually clustered together in a small area of the city center and are nowhere near as common or popular as the more typical Spanish “bar” described above.